Ascending Butterfly: Energy Muse Freedom Beads Necklace Giveaway! Ends 02/04! Energy Muse Freedom Beads Necklace Giveaway! Ends 02/04! This giveaway is now CLOSED. Thanks so much to our wonderful sponsor Energy Muse! The winner has been notified and upon confirmation, follower name will be posted both here and on our homepage. Remember: There are great giveaways active on the upper right hand side of the page! Energy Muse will be back VERY soon with a special Valentine's Themed Giveaway, so stay tuned! I'm sure the name Energy Muse is quite familiar to you by now. We worked with them last year for a very special Holiday Giveaway (you can read that HERE) and they also recently contributed to our Mid-Month Moment of Health Special Feature about the physical and spiritual benefits of the practice of Yoga. (You can re-visit that article HERE). Today has been an especially stressful day, and I've had to call upon every tool in my arsenal to remain on an even keel! Sometimes finding balance in the stillness of meditation doesn't always happen, and it's a balance of meditation, yoga and some stillness that does the trick. So Are Your Chakras in Line? Chakras are energy locations in the body that regulate the flow of energy through the body. 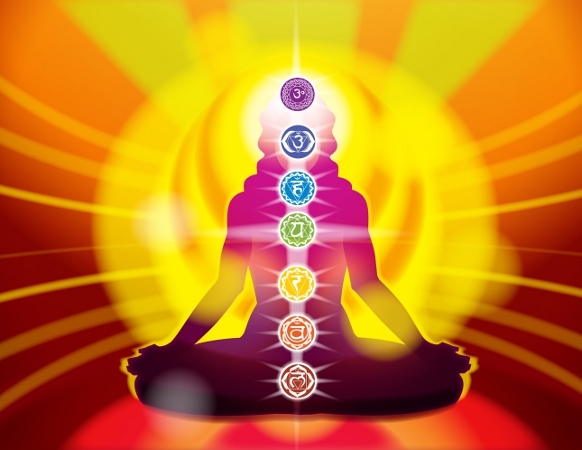 There are seven main energy centers known as chakras in the body. They are spirals of energy, each one relating to the others. Using the seven colors of the spectrum, Color Therapy aims to balance and enhance our body’s chakras and also to help stimulate the body’s own healing process. Color Therapy uses color to re-balance the Chakras that have become depleted of energy. Color has a profound effect, not just on our moods, but on all levels, physical, mental, emotional and spiritual. If our energies become blocked or depleted, then our body cannot function properly and this, in turn, can lead to a variety of problems. Practitioners of holistic medicine who believe in the importance of treating body, mind and spirit understand that Color Therapy can be so helpful since color addresses all levels of our being. Ƹ̵̡Ӝ̵̨̄Ʒ - Root chakra: This is the first and lowest chakra, located in the perineum. It's believed to govern your basic survival instincts. The root chakra is represented by the color red. Ƹ̵̡Ӝ̵̨̄Ʒ - Sacral chakra: This second chakra is located level to your naval, and governs your creative and emotional energies. It's represented by the color orange. Ƹ̵̡Ӝ̵̨̄Ʒ - Solar plexus chakra: The third chakra is located at about the same level as the bottom of your sternum. It's thought to govern your energy and activity levels. It's represented by the color yellow. Ƹ̵̡Ӝ̵̨̄Ʒ - Heart chakra: The fourth chakra, located at heart level, is said to govern love and relationships. It's represented by the color green, but can progress to rose for those who learn to love unconditionally. Ƹ̵̡Ӝ̵̨̄Ʒ - Throat chakra: This fifth chakra governs your ability to communicate and take action. It's represented by the color blue. Ƹ̵̡Ӝ̵̨̄Ʒ - Brow chakra: Chakra number six governs your spirituality, intuition and thoughts. It is sometimes referred to as the "third eye", and is represented by a deep purple color. Ƹ̵̡Ӝ̵̨̄Ʒ - Crown chakra: This seventh and final chakra governs understanding and wisdom. It is represented by either violet or white. Be free to wrap and wear how you choose. These Balinese colored glass beads are made from recycled glass. Each bead has a unique shape and finish. The colored glass is hand strung with a natural cotton cord that compliments the casual and rough finish of the beads. Feel the Bali spirit, wear them and be FREE! Whether or not you put faith in Yoga and the benefits of it's regular practice or even into the concept of chakras, there's no denying that the Freedom Bead Necklace is certainly attractive in it's own right! With the high levels of stress I've had to deal with this week, having an extra tool in my arsenal to help re-balance my energies is just what the Doctor ordered! Ƹ̵̡Ӝ̵̨̄Ʒ - GREEN - And by 'green' I don't just mean the color of some of the beads! The fact that the beads are recycled means our planet's energies and resources were not depleted. The Recycled Glass beads, in addition to being pretty, are very much eco friendly! Ƹ̵̡Ӝ̵̨̄Ʒ - LENGTH - I truly appreciate the length of this necklace. I can wear it long, and I can also double it for less length and a greater visual impact with the color. Ƹ̵̡Ӝ̵̨̄Ʒ - None! Pretty and Truly Functional, what's not to love? Can a piece of jewelry remove all stress from your life? No. But what this necklace can do, with effort on your part is to enable you to keep the energies flowing and in balance. With your energies in balance, you are truly free, so it's name 'Freedom Beads Necklace' couldn't be more appropriate! Ƹ̵̡Ӝ̵̨̄Ʒ - WIN IT! - Ascending Butterfly and our friends at Energy Muse want you to win a Freedom Beads Necklace too! Don't you just ♥ Energy Muse? I know I do! (2) MANDATORY entry- Visit our friends at Energy Muse and LINK us to another item that they sell that catches your eye! REMEMBER: You CANNOT post a link to the Freedom Beads Necklace or the entry will be automatically disqualified. Ƹ̵̡Ӝ̵̨̄Ʒ - While you are visiting their facebook page, they are currently having a twitter contest you can participate in this weekend, read all about it on either their facebook or twitter page! FTC Disclosure Info for this Giveaway: This is not a paid insertion. This is a non-compensated post and all opinions regarding the product and the sponsor are my own experiences. I was provided product to facilitate the review and giveaway. Sponsor is fulfilling directly to prize winner(s), this in no way influenced my opinion of the products. Once a winner is selected and their information has been forwarded to the sponsor, the responsibility of prize fulfillment, rests with the sponsor. In Addition, this is not intended as medical advice, readers understand that they should check in with a physician before undertaking any new physical fitness practice. I Like Energy Muse on Facebook and left a message. Thank you for the contest!! I'm a gfc follower! Great post and giveaway! I also think the Bloom Bracelet is pretty.. Thanks so very much for a chance! I like the Present Necklace w/ Pendant. I love the attraction bracelet with coin! Thanks so much for the giveaway, I love finding new places to shop! I follow your blog. The Aphrodite Necklace - Long Style looks very nice! I tweeted the requested message at http://twitter.com/likwan/status/33581806179590145. I follow @energymuse on Twitter under the name likwan. I became a fan of Energy Muse on Facebook under the name Lily Kwan and let them know you sent me.